Mother of Alfred (1833-1896), Robert (1829-1896), Ludvig (1831-1888), Emil (1843-1864) and two children who died as infants. Andriette Nobel (maiden name Ahlsell) was a gifted woman, daughter of an accountant. 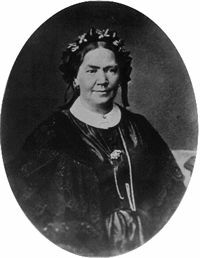 In 1827 she married Immanuel Nobel and for a couple of years the two lived in Stockholm under reasonable economic conditions. In 1833 Immanuel Nobel went bankrupt and the family had to move to simpler living quarters at Norrlandsgatan 9 in Stockholm. This is where Alfred Nobel was born. During five difficult years when Immanuel was trying to start a new life in Finland and Russia, she provided a modest income for herself and her children by running a milk and vegetable shop. Andriette was very supportive of her husband and was very close to her son Alfred. In spite of his dislike for the Swedish climate and food, Alfred Nobel would always return to Sweden to celebrate his mother’s birthday.